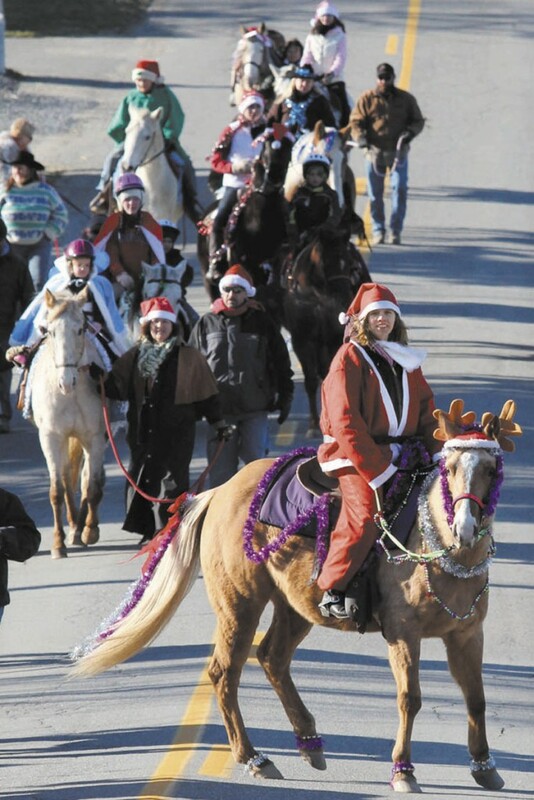 VASSALBORO -- Horse owners and enthusiasts celebrated Christmas on Sunday the cowboy way with an annual parade. 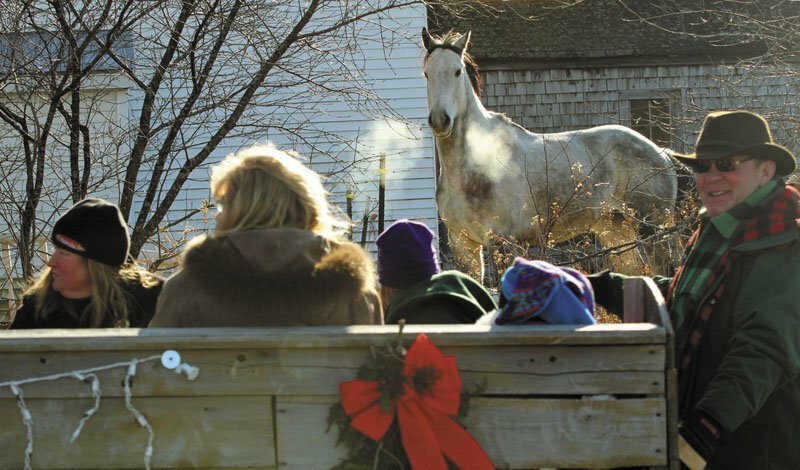 VASSALBORO — Horse owners and enthusiasts celebrated Christmas on Sunday the cowboy way with an annual parade. More than 30 families participated in the second annual Cowboy Christmas Parade organized by Brenda Hemphill of Hemphill’s Inc., a tack shop that deals in horses on the Oak Grove Road. This year the parade is dedicated to Elizabeth “Lizzy” Green, an 11-year-old who had both her legs broken in a car crash two weeks ago. A pot luck benefit supper was held after the parade and all proceeds given to the Green family, Hemphill said. Hemphill had hoped the little girl could make an appearance Sunday. Lizzy was released from the hospital, but her mom, Bonnie Green, said it would be too much for her daughter. Lizzy has had four surgeries at Eastern Maine Medical Center in Bangor. It will be months before she is able to stand, her mother said. She said Lizzy is doing well. It will take time, but doctors have assured her the outcome looks good. Hemphill said the family has had to travel back and forth to Bangor from their Vassalboro home to the hospital and therapy sessions. She said people wanted to help the family. “It’s nice to get into the spirit and help somebody else,” Hemphill said. Last year, she said there were 40 parade entries about 200 people on the sidelines. Hemphill said her father, who past away five years ago, loved Christmas and horses. The family decided a Cowboy Christmas parade was a nice way to remember him. Kelly Henderson of Sidney said local businesses donated items for the raffle and silent auction. While she prepared for the pot luck supper, horse owners were outside decorated their animals with Christmas bells and tinsel, Santa suits and reindeer antlers. “Folks from all over came here today just to participate and be part of the horse community and the fundraiser,” Henderson said. Henderson’s 10-year-old son, Daniel, rode “Six Flat,” a registered painted mare, in the parade. He said the 20-degree weather was a “minus,” but he was more than happy to endure it for the sake of Lizzy. Michele Jatie, 17, of Smithfield, was busy decorating her 11-year-old quarter horse, Adona, for the parade. Jatie also said she was a good friend of Lizzy and wanted to show her support. Adona, who didn’t seem to mind a cloth antler hat on her head, stood quietly while her owner wrapped silver garland around her legs and strung strains of bells around her neck. 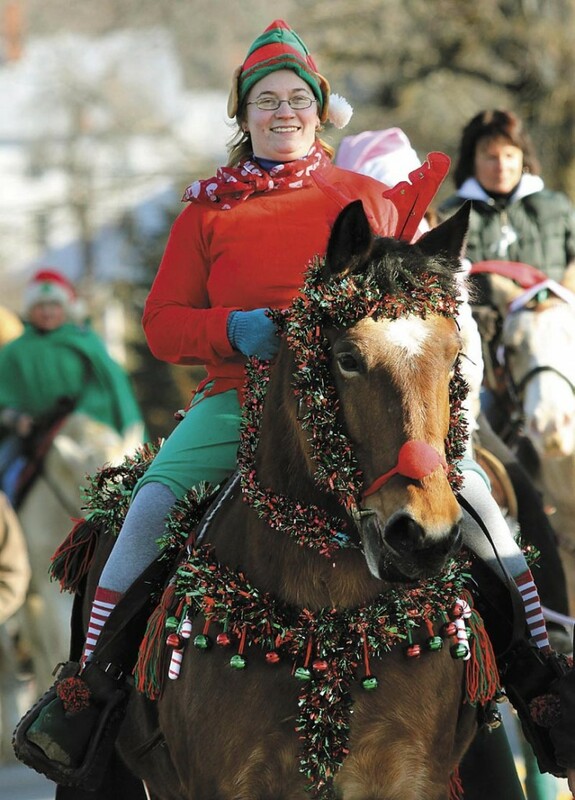 Cari Bernier of Sidney didn’t own a horse, but wanted to participate in the parade. In place of a horse, Bernier brought her 10-month old Great Dane, Ella, dressed in a red Santa suit. “It’s for a good cause, that’s why we came,” Bernier said.